I never really count Autumn as actually here until Ren Faire ends. Ren Faire is my bridge between summer and fall and when it concludes, it is time to move into the colder time of the year. We had a spectacular last weekend at the Fest - warm (really warm summer temps) temperatures in the upper 70's and lower 80's (that's between 21 and 26 degrees C for my European friends). So it was actually hot except for the early morning which was quite cold. 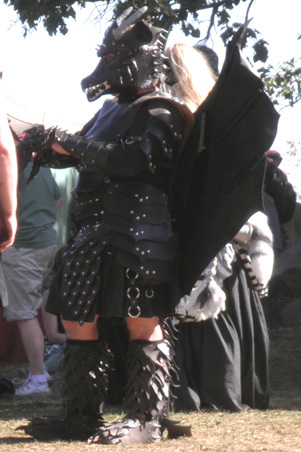 The dragon in this pic is typical of the more outre costumes that appear on closing weekend. The fact that we were not freezing to death was wonderful and quite rare! 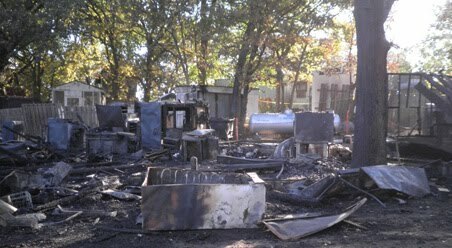 The pics are from the fire that happened on the fest grounds early Friday morning. 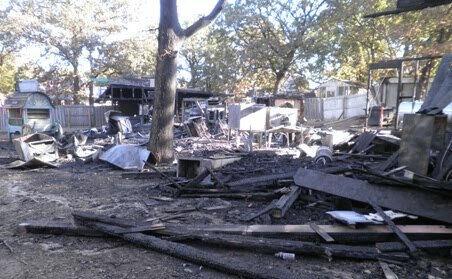 It was pure luck that the propane tank in the background didn't blow - that would have been VERY bad. Six booths were destroyed. At least one of the owners who had two of those booths did not have fire insurance, so he's out a ton of money. Next year we'll have nice, new booths there because it's prime real estate. But I have no idea what foods will be featured. It was Irish Weekend and we had been looking forward to it because our favorite New Zealand Meat Pies food truck would be there for the second time this year. Their food is simply amazing. Similar to Cornish Pasties for those familiar with the flaky-crusted enclosed pies, they offer a breakfast and a meat pie version. I'm totally addicted to both. And their banana cake, with home-made sour-cream frosting and drizzled dark chocolate - OMG!!! I had one of their breakfast pies and returned later for one of their meat pies for lunch. My DH had two of the breakfast pies and one of the meat pies. I had one piece of banana cake, and DH had two. I didn't eat anything else, although I had iced tea to drink. DH was very exhausted, and I was really tired also. After some discussion, we decided that we would leave early, even though it was last weekend and we usually close the show down. It's always very sad to do that though, it means saying goodbye to many people that we won't see again for another year. But we were tired - maybe we're just getting old. So we bought our munchies for the coming week(s) and left about 4:15 pm. We both agreed later that we were happy we had made that decision, and we went to sleep early - about 8:30 pm. Current Location: Late for my shower...gotta run! Love the dragon! I'm glad you had a good time. it has been as hot here in the UK. I'm very relieved cooler weather is forecast. Thanks, Linda. I hope you get your cooler temperatures. We're at summer temps for the week and it's a refreshing change for October.